1. 8-10 bran biscuits or digestive biscuits. 1. 1 cup skimmed milk. 2. 1/2 cup condensed milk. 5. 11/2 cups drained skimmed milk yogurt. 6. 2 cups skimmed milk cottage cheese. 7. 2 cups mango pulp. 8. 1/2 teaspoon mango essence. 9. 1/2 cup sugar, powdered. 1. 1 tablespoon mango jelly crystals. 1. For the crust, crush the biscuits to a coarse powder and place in a bowl. Add the butter and mix well. Place the mixture in a six-inch springform tin lined with greaseproof paper. Press the mixture lightly and place in the refrigerator to set. 2. For the filling, heat the milk in a pan. Add the condensed milk and mix. Mix the cornflour with a little milk and add it to the hot milk. Cook, stirring continuously, till the mixture thickens. Set aside. 3. Mix the carrageenan in a little water and heat in the microwave for one minute. Remove from the microwave and set a side. 4. Place the drained yogurt in the bowl. Add the cottage cheese and whisk well. Add the mango pulp and mix again. Add the mango essence and the milk mixture and mix again. Add the powdered sugar and blend with a hand blender. Add the dissolved carrageenan and blend again. 5. Pour the mixture into the prepared tin over the biscuit layer. Refrigerate for two to three hours. 6. For the topping, dissolved the mango jelly in a quarter cup of water, bring to a boil and cool. 7. 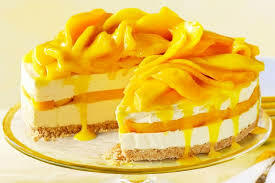 Spread a layer of mango jelly over the set cheesecake. Chill until the jelly sets. 8. Remove from the springform tin and cut into eight wedges with a sharp knife dipped in hot water. Serve chilled decorated with chopped mango.